ROLEX REF. 6062 TRIPLE CALENDAR STEEL A very fine and rare self-winding stainless steel wristwatch with triple-calendar and moon phases. Bracelet Stainless steel riveted Rolex bracelet with deployant clasp, 150 mm. Signed Dial, case and movement Reference 6062 was produced from 1950 to 1953 in 350 examples, in 18K yellow gold, 50 examples in 18K pink gold and very few in stainless steel. The yellow gold 6062 remained in the Rolex catalogue until 1960. It is interesting to note that in period advertising, this watch was referred to as the Oyster Perpetual COSMOGRAPH. Rolex has produced only two different models of triple calendar with moonphase wristwatches, reference 8171 and 6062. Both models are automatic. However, reference 8171 has a snap on back, while reference 6062, the Oyster version, has a water resistant-type screw back. 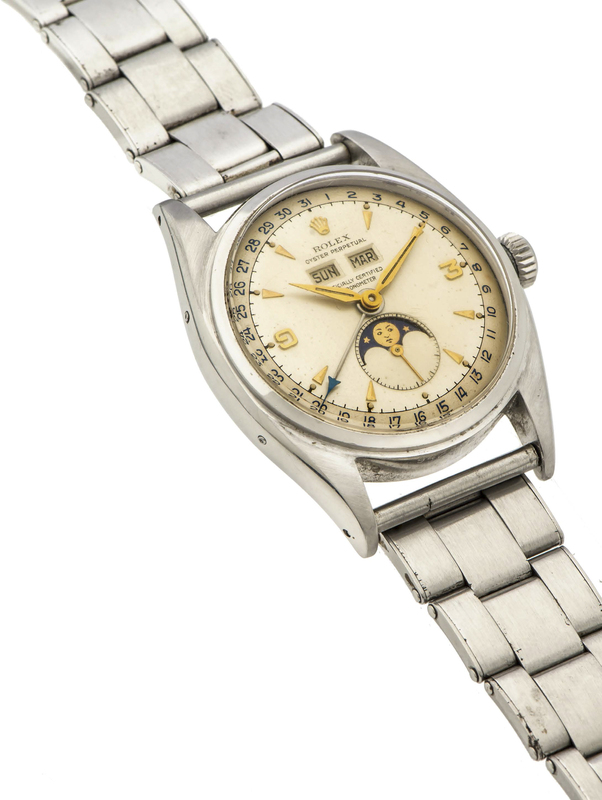 This watch belongs to a Hong Kong collector and has never been offered at auction. He purchased it in Switzerland around 1955, as a personal gift after his graduation from Imperial College London. Offered either with steel or gold indexes, this example has been maintained in excellent condition. The dial still features its luminous dots matching with its luminous hands and the dial has an attractive two-tone color. Even rarer, the elusive lightly engraved "Registered Design - Model Depose" is still clear and deep on the outside caseback, a definite sign of a very well preserved and little worn example. And even more surprising it is equipped with a rare expendable riveted Rolex bracelet dated 1955, which may very well have been born on the watch. An extremely desirable all original 6062 example, one of the nicest to be offered in the last couple of years.